On the Thursday morning of 21 March two mammoth ships moored in Eemshaven. The cruise ship ‘Spectrum of the Seas’, with a length of 347 metres, was the first to arrive and moored at Buss Terminal Eemshaven on the northern side of Julianahaven. Then came the long-awaited Boabarge 43 with a topside on board, a yellow colossus that will act as a kind of socket at sea for the Deutsche Bucht wind farm. This topside is moored at the quay near Wagenborg on the southern side of Julianahaven. 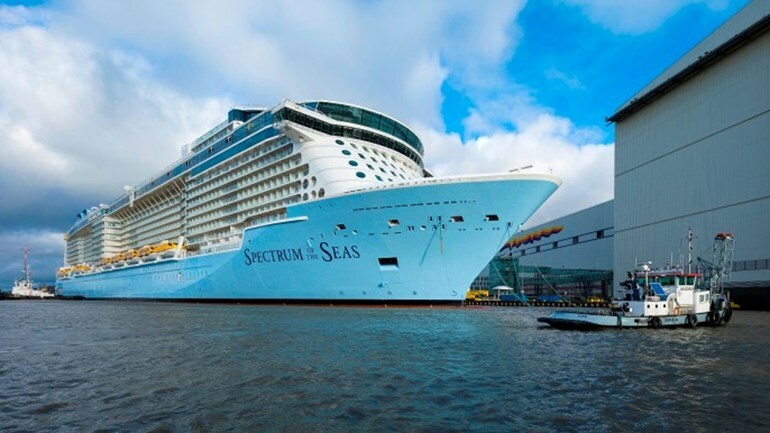 The cruise ship Spectrum of the Seas was built by the Meyer Werft in Papenburg, Germany. The ship is designated for the Royal Caribbean shipping company, has an overall length of 347 metres and a breadth of 41 metres, and can accommodate almost 4200 passengers. The immense cruise ship will be staying in Eemshaven for a few days. This topside of over 2700 tons is intended for the Deutsche Bucht wind farm. This immense yellow socket comes from the Smulders Group production site in Hoboken (near Antwerp) in Belgium. The 1700-tonne jacket, on which this topside will be placed, came to Eemshaven earlier. Because of the bad weather the jacket couldn’t be navigated directly to the location at sea and therefore temporarily took shelter in Eemshaven. 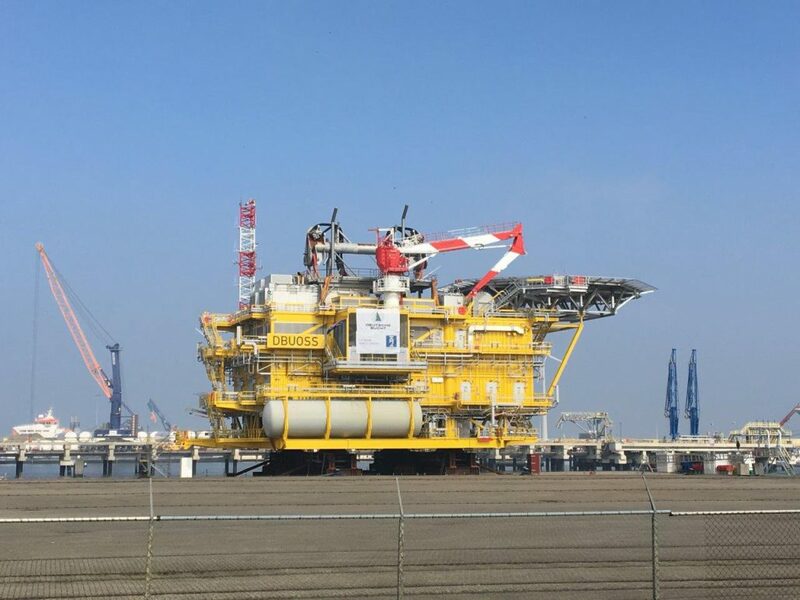 This jacket has long since left for the Deutsche Bucht wind farm where it will be placed on the seabed as the undercarriage of the topside that is now in Eemshaven. Under the current safety regulations, Eemshaven has limited public access. On the dike behind Theo Pouw near the floating jetty (east of Nijlicht) there is an easily accessible viewpoint and the location near the Borkum line is also suitable to view the ships and take pictures.